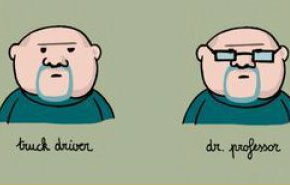 Strange but true, glasses can really change the outlook of people. The butcher becomes an artist and truck driver becomes professor. I never thought about how a detail can change the entire appearance. Of course, the question what happens when they speak up still remains, but at first sight people seem more intelligent with glasses. What to say except ... it's time to get glasses.